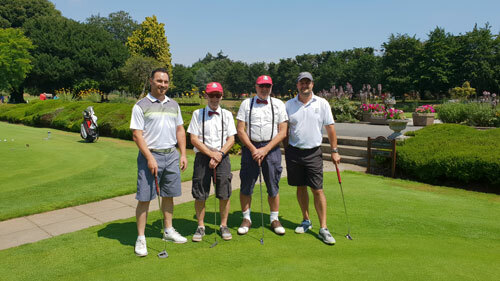 Our Directors played their third match of the AME Golf Challenge 2018 against Dave Richards and Alan House of APH. It was a very close fought match that looked as though it could be heading all the way down the 18th. However a par from Simon on 17th was enough to secure a 2&1 victory for AME. Although Dave and Alan didn’t win on the day, I am sure you will agree they will win first prize for best dressed. If only there was a prize!! Kate and Rich Dyer from @ashleyhouseprint stay out in front with their 3&2 win, Steve from WPS Insurance and Chris from Natwest stay second, and Dave and Alan are third. Next up on 3rd August is Matt Cotton and Paul Taunton from Wall to Wall Sunshine. With the big playoff final at the end of the golf season, who will be our 2018 champions?